Rice Flower is classified until recently as Helichrysum diosmifolium. When in bud the flowers look like large rice grains, hence the name. The small flowers occur in clusters of up to 100 at the ends of the branches and are usually white, but light to dark pink forms are also known. The leaves are small and linear in shape. 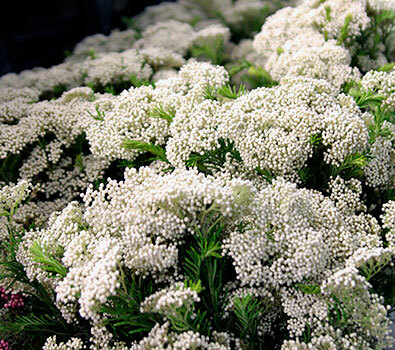 Rice flower is used as a floral filler, in much the same way as Gypsophila. Pimelea nitens, which flowers in summer, is also called rice flower, but does not look like Ozothamnus at all.Rice flower is grown in the field.